We Make Moving Easy, Affordable and Care-Free! A stress-free moving day is possible, and we do it every day. When you book your move with Discount Movers moving company you will enjoy a quick and easy phone interview with an immediate free moving estimate. You will be e-mailed helpful moving tips that will save you money and help you prepare. Our attentive customer service will make you smile and feel relaxed. Our friendly, professional, experienced, well spoken, licensed and insured movers will arrive on-time, working efficiently and effectively saving you money on the total cost of your move. At the end of your move, you will be elated at how much money you saved and how easy everything was. Who says that moving has to be stressful, not us. 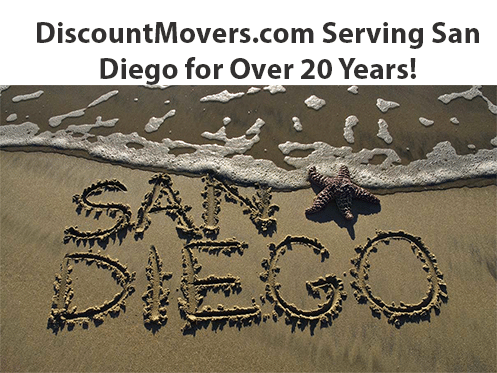 As one of the oldest moving companies in San Diego, Discount Movers is committed to making your moving day a GREAT DAY! 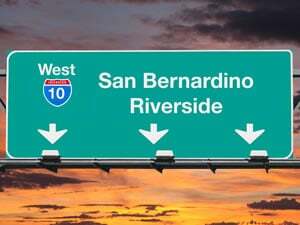 Are You Moving from San Diego to OC, LA, Palm Springs, Riverside or Santa Barbara? We can help you save money! #1. SAVE MONEY: Fast, efficient movers in San Diego will save you money when paying by the hour. #2. PROTECT VALUABLES: Our experienced, licensed & insured movers transport goods to protect. #3. FAST & FRIENDLY SERVICE FOR 20 Years: Established reputation in the industry for excellence. #4. FREE SUPPLIES: Shrink wrap services on furniture and FREE Wardrobe Boxes. #5. EXPERIENCED MOVERS YOU CAN COMMUNICATE WITH: This is important the day of your move. Over $150 of FREE Wardrobe Boxes to use the day of your move to transport your hanging clothes. If you need other moving boxes, our sister company is here to help. FREE Unlimited shrink wrap and furniture pads that our San Diego movers will put on your furniture to protect it. FREE Fully equipped moving trucks with dollies, ramps, mover pads and everything needed to move your home effectively. San Diego Moving Company Choice for a Lifetime! “Our professional San Diego movers often move the same person from an apartment to a condo, to a house 10-12 times as they transition through life stages. Overall, we help our customers transition both in happy times with marriage and kids, and sometimes in challenging times like divorce, a rental house being suddenly sold and job loss. We understand moving can be stressful in happy and in hard times. We understand the sensitivity of moving and work hard to make our customers moving day better because of our team’s excellent, and attentive services. Wishing you an excellent move and thank you for your continued business over 20 years. Sincerely, Jerry Berzanski, President and Owner of Discount Movers. Our Movers Work Hard to Make Your Moving Day a Great Day! If you are looking to hire a top rated, licensed and insured San Diego moving company, you have come to the right place. Our professional movers are fast and experienced with A+ BBB ratings. Our seasoned movers, packers, truck loaders and storage movers are here to help ensure that our customers have a great moving experience. As one of the oldest local San Diego moving companies, we are proud to have consistently achieved A+ ratings in the BBB for over 20 years with hundreds of thousands of moves. We have hundreds of 5 star reviews on Yelp, Google, Facebook and more…. Watch How Our FAST San Diego Movers Will Save You Money! History of happy customers for over 20 years. We have the highest repeat business & referral rating in the industry. Our moving company in San Diego has movers have been with us for years (4-8 years) and our Operations Manager and Assistant Manager have been with us between 15 and 20 years. This is important for you to know because it is rare with any moving company. When you hire Discount Movers, you will know the quality of people that are coming into your home and the fact that we have a long, successful history with them. Our moving company in San Diego believes in taking good care of our employees, and they take good care of you. 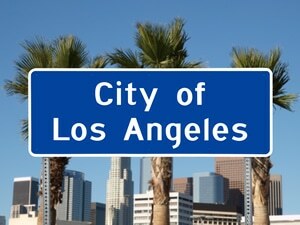 Lowest rates for licensed, insured and experienced San Diego movers. You can call of the licensed and insured moving companies in the area and you will see that our rates and speed of service are unmatched. We are proud to be a local San Diego moving company with top ratings in the BBB. Our record of 20 years speaks for itself. This says a lot considering we do a high volume of moves each month. Low rates combined with fast service is where you will save the most money when you are hiring a local San Diego movers that charge by the hour. 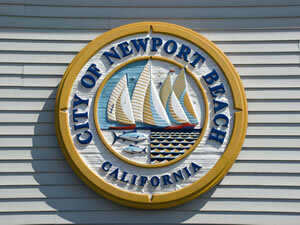 It is very important to only look for a licensed and insured San Diego moving companies. Discount Movers is fully insured, licensed and a member of the BBB, with top ratings for over 20 years. Our moving company in San Diego offers a wide variety of moving services including full service local moving in San Diego, in addition to daily runs from San Diego to OC, LA and Palm Springs. Our team can also pack your home in moving boxes a few days before your move. If you have a U-Haul or Penske truck, we can help you load or unload your truck in San Diego. 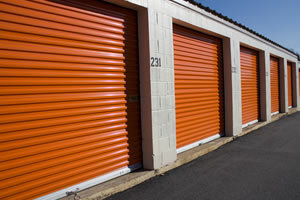 Our San Diego moving company also can help you move items into your storage unit, even if it is only a few pieces. We can also help with San Diego furniture delivery services and auction furniture moving anywhere in San Diego. Basic valuation insurance includes .60 cents a pound in the unlikely event of damages. It is helpful to know that you can also purchase third party insurance if you want full replacement coverage in addition to the basic valuation coverage. More information on additional insurance options. Out of all the moving companies, we are proud of the fact that we have been pre-approved with the leading insurance companies. This is due to the fact that we have an excellent service history and low claims rates. Deciding if you want to buy moving insurance or not? We provide all of our customers with FREE “Basic Valuation Insurance” in protection of your move. If you want to purchase third party insurance, (which offers full replacement coverage) you can. Discount Movers only hires experienced movers who know how to move quickly, yet still being careful. As a result, your risk of damages is greatly decreased because you are working with professionals who have experience. How do I save money by using Discount Movers? Most local moving companies charge by the hour. Our movers are so efficient that they typically do 2 jobs per day, which is how they personally make more money. This is different than most moving companies in San Diego who will make more money the longer they are at someone’s house. (An 8 hour move will cost a lot more than 4 hours) By completing your job quickly, and having another move scheduled, we pass on the volume savings to our clients. What can I do to prepare for my move that will help me save money? 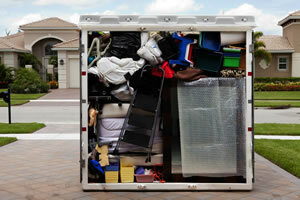 How do you charge for moving services and are there certain days that are less expensive? We charge hourly. The hourly rate is dependent on how many movers are being utilized and the day of the week you are moving. It is less expensive to move Monday-Thursday then it is the weekend. This is a quick way to save money if you have that flexibility. In addition, there is a minimum amount of hours charged based on the size of the move and the distance between moving locations. Do you offer professional packing services? Yes, we can also pack all of your items for an additional charge. Please note, this is never done the same day as your scheduled move. Typically, we come the day before your move and pack all of your small, loose items into boxes and have everything packed and ready to go for your move the following day. You will need to tell your moving consultant that you want packing and moving and they will schedule the packers for you the day prior to your move. The same rates and minimums apply to packing in addition to supply charges for the boxes, tape, paper, etc. 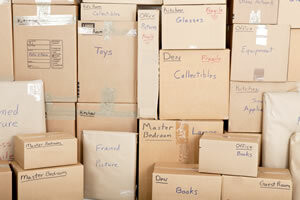 What is included in your moving services? The movers will bring all the necessary equipment to move your household items. Please let our phone representatives know if any items need to be disassembled prior to moving and we will make sure to have the proper tools needed on your moving day. They will also bring moving blankets and shrink wrap for all large items that need additional protection when moving. You will want to have all the small, loose items already packed in boxes that are taped up and stackable (if you don’t want to pack we can send packers the day prior to your move for an additional charge) and ready to go. We will provide free wardrobe boxes for all clothes on hangars. Please let our phone representative know how many wardrobe boxes you will need for your move. If my move goes longer than the minimum hours that I was given in my estimate, how am I charged? We do not round up to the nearest hour like some moving companies. We charge in 15 minute increments. As an example, if your moving time is 4 hours and 15 minutes some companies will charge 5 hours. We will only charge you 4 hours and 15 minutes (i.e. if it is $100 per hour and your move goes an additional 15 minutes you would be charged an additional $25). Why do you give phone estimates versus coming to our house? As Discount Movers, we provide value everywhere we can. 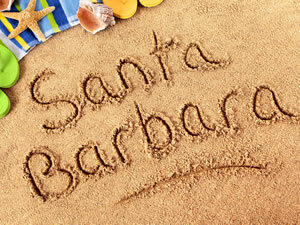 Our services are charged by the hour versus the weight (like long distance companies in San Diego). We have an effective process to help us understand what we will be moving over the phone to provide our customers with an estimate. This helps keep our costs low. We pass on this savings to our customers. On occasion, we need to go in person, but for 99% of moves this is an added cost our customers don’t want or need. Do you have the insurance requirements needed to move within my condo or business location? Yes, we have 1 million dollar coverage per move which is typically more than enough to move within any condo association or business building. In fact, we are preferred movers for almost all of the larger condo associations in San Diego. Please clarify with your association or building their insurance requirements and make sure they have all the insurance paperwork needed from us prior to your move. Are the movers who are moving my household items your employees or are they independent contractors? We do not and will not use independent contractors. All of our movers are employees. The majority of our movers have been with the company for many years. They are our employees that we are quite proud of. We like to hire people who can effectively communicate with our customers. Many of our San Diego movers have made a career working at Discount Movers and we take good care of our team. Our moving company in San Diego is proud to have A+ BBB ratings, and top reviews on Google, Yelp, Superpages, Citysearch, Yahoo, Customer Lobby and dozens of other sites. Our goal is to make our customer’s San Diego moving day, a GREAT day!